Newfoundland, like other parts of British North America, suffered from a chronic shortage of small denomination coins during much of its early history. The British government made no effort to provide a local currency and the islanders had to make do with an insufficient supply of badly worn foreign coins. Finally, as had happened elsewhere, the local merchants decided to take matters into their own hands. The first to do so were the Rutherfords, who operated a store in St. John's under the name of R. & I. S. Rutherford and another in Harbour Grace under the name of Rutherford Bros. Three tokens of similar designs were issued, all with a nominal value of a halfpenny. Two were for use in St. John's, one with no date and the other dated 1841 and a third, dated 1846, for use at Harbour Grace. The arms of the Rutherford family are on one side of the token and a suspended sheep carcass on the other. 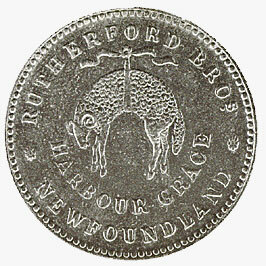 The sheep design, copied from an English trade token, had little relevance to Newfoundland. Perhaps the only explanation for its use is that the tokens were manufactured in England. The original tokens were made of copper but brass counterfeits soon appeared. So great was the shortage of coins in Newfoundland at that time that the counterfeits were readily accepted and circulated freely along with the genuine pieces. It was not until 1865 that the first official coins were issued by the government. The token illustrated is in the Bank of Canada's National Currency Collection.